KUALA LUMPUR, 15 March 2017 – iBanding Services Sdn. Bhd. (“iBanding”), an independent, knowledge-based company that provides transparent insights about the local insurance industry, today awarded Syarikat Takaful Malaysia and Allianz Malaysia for the Best Motor Takaful Company and Best Motor Insurance Company in 2016 respectively. 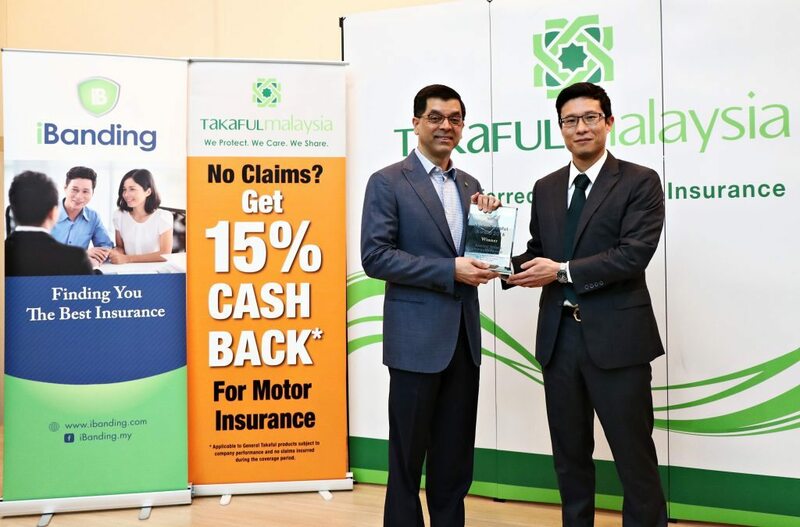 The Awards are based on the results of a study conducted by iBanding, which ranked insurance companies in Malaysia on actual feedback from Malaysian motor vehicle drivers¹. The Study is based on the Net Promoter Score (NPS) methodology², which closely examines customer satisfaction. iBanding’s Study also uses statistical methods and fraud detection³ parameters to ensure unbiased results. From 4,000 unsolicited responses received nationwide in 2016, 2,600 responses were accepted, with Syarikat Takaful Malaysia scoring the highest for Islamic Insurance or more often called Takaful, and Allianz Malaysia for Conventional Insurance. Group Managing Director of Takaful Malaysia, Dato’ Sri Hassan Kamil receiving the award for Best Motor Takaful Malaysia 2016 from iBanding’s Founder, Mr. Luke Roho. It is not surprising that the top three considerations cited by Takaful insurance holders were the same ones cited by Conventional insurance policy holders. For these consumers, Allianz Malaysia was able to provide top-notch service, resulting in them winning the Best Motor Insurance Company in 2016.
iBanding’s recognition of Syarikat Takaful Malaysia and Allianz Malaysia as the best motor insurance providers in 2016 is not like any other award within the industry. Besides providing valuable insights from its annual study, iBanding’s yearly ranking of motor insurance companies for both Conventional and Takaful motor insurance provides consumers with the knowledge and confidence to choose the best insurance company that is right for them. Luke Roho, Co-Founder of iBanding elaborates, “For the past 30 years, Malaysians do not feel that it was necessary to shop around to compare different motor insurance policies. This was because motor insurance prices have been regulated by a tariff structure, which is set by Bank Negara Malaysia. This will change with the introduction of Motor Detariffication in July this year. With the implementation of Motor Detariffication, motor insurance prices are no longer regulated. This means that insurance companies will be able to set their own prices and offer a variety of differently priced services to consumers. However, lower price does not mean that the service offered is better. Our motor insurance ranking and insurance award will help consumers decide what company is best for them based on price and service quality. Ideally, consumers want to buy insurance with the best service and lowest price. iBanding is the first of its kind company in Malaysia that offers transparent, independent consumer insights into the motor insurance industry, “We are in a great position to lead the industry after detariffication is implemented, as there is no other independent company that provides insights into consumer experiences for motor insurance. We take this responsibility seriously and are dedicated to help consumers learn more on insurance, and provide independent information to Malaysians, so that they can find the best motor insurance for them,” concluded Roho. ¹iBanding’s annual Motor Insurance Award is Asia’s first motor insurance award that is based on actual customer feedback instead of decisions by a panel of judges. ²The Net Promoter Score (NPS) methodology is a powerful management tool that can be used to gauge the loyalty of a firm’s customer relationships. It serves as an alternative to traditional customer satisfaction research with more than two thirds of Fortune 1000 companies using the NPS. ³iBanding utilizes statistical methods and fraud detection to ensure that results are representative and valid for Malaysian drivers. In 2016, only 16 companies were ranked instead of the 30+ insurance companies in Malaysia, as statistical significance was too low to be representative. Additionally, out of the 4,000 responses received, only 2,600 were accepted after automated checks. PDF. Press Release MIA2016 eng. PDF. Press Release MIA2016 BM.